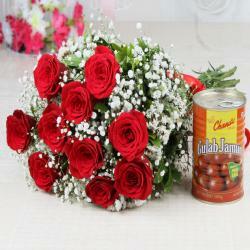 Sophisticated, elegantly, stylishly, this incredible bunch of flowers containing ten red roses, No wonder people have maintained flowers as their best choice of gifts for special occasions. 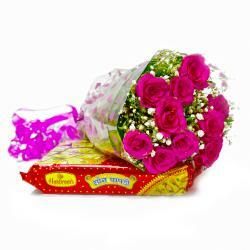 Give surprise on special occasion like Birthday, Anniversary, Wedding, Bhaidooj, Mothers Day and many more. This is a classy bunch of rose comes in red colors that are adorned in cellophane paper wrapping for a better grip and attractive packaging. A matching ribbon is also used to tie the bunch in bow shape. This delicious gift of Kaju Katli add extra splendid effect. So go on and book your order now to send love to dear ones. Also send this hamper for your loved ones along with other bewildering Gifts to India through Giftacrossindia and make your dear ones feel special. 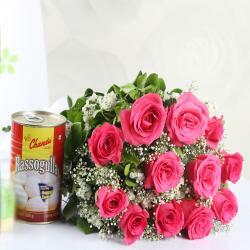 This gift hamper contains : Bouquet of 10 Red Roses along with Box of Kaju Katli (Weight : 500 Gms).